Dreamland, Margate (UK) is one of Britain's most famous seaside amusement parks. Opened in 1870 as Hall-by-the-Sea, before changing its name to Dreamland in 1920, it is the oldest amusement park in the United Kingdom. 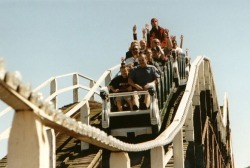 Dreamland is home to the Grade II listed Scenic Railway roller coaster, the oldest roller coaster in the country. The park is also home to a Grade II* listed cinema of international importance and Grade II listed menagerie cages, the oldest zoo cages in the UK. Dreamland is also central to the area's local economy as the Isle of Thanet's most-visited tourist attraction. In January 2003, the owner of Dreamland announced that the park is to close and be redeveloped. Click here for the latest news of the campaign to keep the park and its heritage assets open for future generations to enjoy. How did the Scenic Railway become a listed building? Download the report which resulted in the Scenic Railway becoming a listed building. 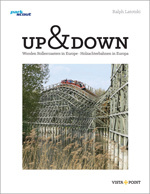 New book celebrating wooden roller coasters has been released, featuring a chapter on the Scenic Railway. 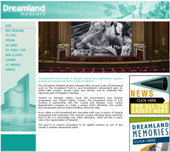 Dreamland proposals shown at the 'I Dream of Dreamland' event in Margate on March 2009. Click here for more details of the proposed amusement park of historic rides. To download documents in PDF Format, you will need Adobe Acrobat Reader. Click the image below to download Acrobat Reader. 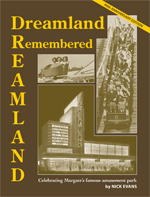 A 90th Anniversary edition of this book, which tells the full story of Dreamland, is now available from here. Secondhand copies of the first edition are available from here. What is happening in the Campaign to save Dreamland? The latest pictures of work at Dreamland. Dreamland reopens on 19th June 2015! Our proposals for a thrilling, 'World's first' visitor attraction. The Save Dreamland Campaign is administered by The Dreamland Trust. How to donate to the Trust's fighting fund. Plus your chance to by Dreamland photos and gifts. Your chance to buy Dreamland photos and gifts. Photographs of Dreamland, the Scenic Railway and Campaign events. The Campaign's objections to the Thanet Local Plan. The Campaign's objections to the Margate Masterplan. Find out about Dreamland planning applications. Our vision for a new Dreamland. Stories, poems and articles submitted by members. Discuss the Campaign on our message board. Contact details for press interviews. Save Dreamland Campaign press release archive. Other internet resources on Dreamland and the Scenic Railway. How to get to Dreamland Fun Park. Click here to return to Joyland Books for the biggest selection of amusement park books on the Web!